The ceiling sensor is the preferred infrared sensor for optimum performance. It comes standard with Forum, Maxim III, Spectrum II, VoiceLink I, VoiceLink Plus, VoiceLink III and VoiceLink IV packages. This unit needs to be installed on the ceiling at least 3′-0″ from the video projector. It comes with a mounting/support bracket and 50 feet of plenum rated cable with RCA connector on each end. 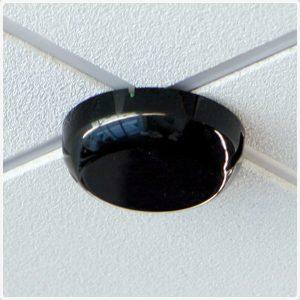 The ideal location for the dome sensor would be in the center of the ceiling. This will provide a clear signal path for the IR transmission from the transmitter to the dome sensor without obstruction. In addition, you will have 360° coverage and will minimize the transmission distance for more reliable performance. It collects the infrared transmission signal via 6 large detecting diodes. The sensor is connected to the mixer/amplifier via a plenum rated cable terminated with RCA connectors. The mixer/amplifier supplies the power to the sensor.